Indoor air pollution has been described by the EPA and Congress as America's #1 environmental health problem. The EPA also reports that indoor air can be up to one hundred times more polluted than the air outside. Air pollutants and poor indoor air quality can cause allergies, sick allergies, sick syndrome, bacterial infections and spread viruses. The F500 Whole House HEPA Air Cleaner connects to the return air duct of a forced air system or can be independently ducted. 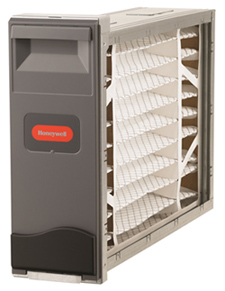 The Honeywell System includes a HEPA filter, a 2" pleated pre-filter, a carbon-odor filter and motor/blower. Today's homes require effective humidity control more than ever before. Equipped with super-efficient central air-conditioning systems, near-impermeable vapor barriers and improved insulation, many new homes suffer from excess moisture problems. Air conditioning alone can't satisfy your home's humidity requirements. Your air conditioning system is designed to control temperature, not humidity, and only removes humidity as a byproduct of cooling. During the spring and fall seasons when it's still cool outside but damp inside, your air conditioning isn't running and your house is uncomfortable - you need a whole-home dehumidifier. A whole-house dehumidifier installs as part of your home's central heating and cooling system with a rated capacity of 90 pints per day. The dehumidifier measures the condition of your home's air to decide when to run. An integrated air cycling feature will activate the HVAC blower to cycle air throughout the house to balance conditions. The dehumidifier has an optional ventilation damper that can mix fresh outside air into the process. A whole-house dehumidifier works equally well in new or existing homes and is truly the complete solution for your home's excess indoor humidity problems. Excess humidity doesn't just exist in one room of your house so why treat the problem in just one room or area? Portable dehumidifiers only operate in a limited area, not your entire home. Whole-house dehumidifiers are located out-of-sight and out of your way with quiet operation, hassle-free maintenance and up to 4 times more energy efficiency than the leading portable dehumidifier. The most efficient and safe way to rid your home of excess humidity is the whole-home dehumidifier. Health Benefits:Excess indoor humidity provides the perfect breeding ground for mold, mildew, dust mites, bacteria and more. A whole-house dehumidifier combats these nasty home invaders, which are linked to asthma, allergies and other serious respiratory problems. Comfort Benefits:Few things impact your home's comfort more than excess indoor humidity. When you turn up your air conditioner to try and get rid of indoor stickiness you're really just making your home uncomfortably cool. Plus, optional built-in ventilation allows you to bring in conditioned, fresh outside air - ensuring your home remains properly ventilated. Protection:Excess indoor humidity allows mold and mildew to thrive-ruining carpets, draperies, furniture and even clothing. It also can cause condensation build-up on windows, destroying their finishes and structural integrity. A whole-house dehumidifier helps protect your home and its contents by removing unnecessary moisture from your home's air whenever it rises to an inappropriate and harmful level. Energy Savings: A whole-house dehumidifier eliminates the need to over-cool allowing for a higher thermostat setting for the same comfort level. And, because it is more energy efficient than portable dehumidifiers it uses less energy for the same amount of moisture removed.